Is anyone else making a basement into a playroom? We have a finished portion of our basement that we have decided to use as a combination Craft Room and Play Room. I have slowly been transforming the room from a plain white box that was used as a storage area into a fun bright and inspiring environment. 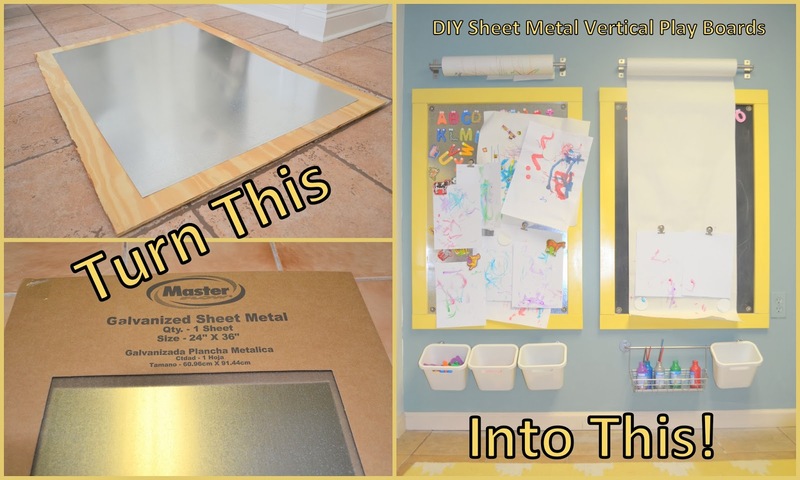 One of the first projects tackled were these magnetic boards. One is a magnetic chalkboard (right) and one is just a magnetic board (left). shoulder strengthening while crafting on her vertical work surfaces! Unlike the other DIY Chalkboards I have made, these are also magnetic, which is great because so many children's toys have magnets and can be used on these: magnetic letters, numbers, gears, animals, the list goes on and on! They were very easy to make and cost less than $20 dollars/each. Best of all, as with all DIY projects, you can make them to fit your space! Our boards are loaded up with drying artwork and magnets! I found a piece of sheet metal that came in 24"x 36" sections. I bought two of these and glued them onto a piece of plywood that I had cut to 29" x 41". You want the piece of plywood to be bigger than your sheet metal so that you can glue your 1x3 MDF boards onto to it for your trim. I cut the trim boards and dry fitted them while my weights (i.e. books) were holding the sheet metal to the plywood as the construction adhesive dried. I bought pre-primed white MDF trim boards (below left). I then spray painted the MDF boards yellow and glued them to the plywood (below right). One board finished with a few magnetic letters stuck to it. been glued to the plywood. One piece of trim has been added to the bottom. We accessorized our boards and also made them into easels using kitchen accessories from Ikea so that we could maximize the space and keep our magnets and art supplies organized. Have you tried making a chalkboard with chalkboard spray paint? It is one of my favorite products - I have used it so many times! Is anyone else trying to transform a white box room into an inspiring playroom? We have lots of plans for this room including a reading nook and an indoor swing!